St. Xavier College, Ranchi was started by the Ranchi Jesuits Society called (Society of Jesus) a Christian Religious Order founded by St. Ignatius Loyola in 1540. Since its foundation, the Jesuits have contributed in the field of education throughout the world. The vision drawn from the life and teachings of Jesus Christ gives Jesuit educational institutions a recognizable character and sets before their management, staff, students, parents and the community high ideals of life and service which will inspire them continuously to strive to meet the emerging needs and challenges. The Ranchi Jesuit Province through St. Xavier’s College envisions the educational development of the Jharkhand state with special attention to the needs of the tribal students of the region. St. Xavier’s College, Ranchi aims at an integral and personalized education of the young by providing well planned Undergraduate and Post Graduate Programmes. It strives to produce intellectually competent, morally upright, socially committed, spiritually inspired and nationally dedicated men and women in the service of India. In the context of emerging global, national and regional concerns, there is an urgent need to work for social justice and respect for life and environment. St. Xavier’s College commits itself to the promotion of justice, preservation of the integrity of creation, responsible use of information technology and mass media, fostering wholesome and simple life styles. It seeks, moreover, to nurture transparency and probity in private and public life and to promote national integration. It aims at empowering the powerless and less privileged particularly the tribals, backward classes, women and other vulnerable sections of the society. The College is an autonomous college of Ranchi University. It offers I.A./I.Sc./I.Com. courses under the Jharkhand Academic Council, B.A./B.Sc./B.Com./Vocational Degree Courses, Post Graduate courses and B. Ed. under the autonomous system. In recognition of its service and to increase its efficiency still further, autonomy has been conferred on St. Xavier’s College with effect from July 2005. In the autonomy setup, this college has autonomy in the matter of - Framing its courses of studies; Arranging for instruction to the students; Devising methods of evaluation, examination and tests, pertaining to the admission of the students in the college and award of the degree/diploma by the Ranchi University. The college is affiliated to Ranchi University which will award degrees with the name of St. Xavier’s College mentioned on them. The College was Re-accredited with ‘A’ by the National Assessment and Accreditation Council on January 2013. UGC has conferred on St. Xavier's college the status of "college with potential for excellence" in 2015. To set and achieve high academic standards in an atmosphere of autonomy. To develop Christian leadership of high calibre and integrity. To preserve and promote the cultural heritage of the region. To stregthen its own faith life. To engage in research and extension activities related to the development issue of Jharkhand. To promote vocational and entrepreneurial education. To involve parents, staff and students in fruitful interaction. To accord priority to the education of Catholic as well as Scheduled Tribe and Scheduled Caste students.To promote vocational and entrepreneurial education. To function as a critique and conscience of society. To set high standards for themselves in every field. To seek and apply knowledge critically to the solution of contemporary problems. To think in a creative, fearless and independent manner. To value and responsibly use their own freedom and respect the freedom of others. To appreciate and respect other faiths and foster religious harmony. To be clear and firm on principles and values and act accordingly. To contribute to the sustainable socio economic development of the neighbourhood, locality and region. To be sensitive to those in need and unselfish in service. To set themselves free from scio-economic, religious, caste and gender prejudices and act as catalysts of social change. To protect, preserve and judiciously use the resources of the earth for the welfare of all. The crest of the college consists of three parts. 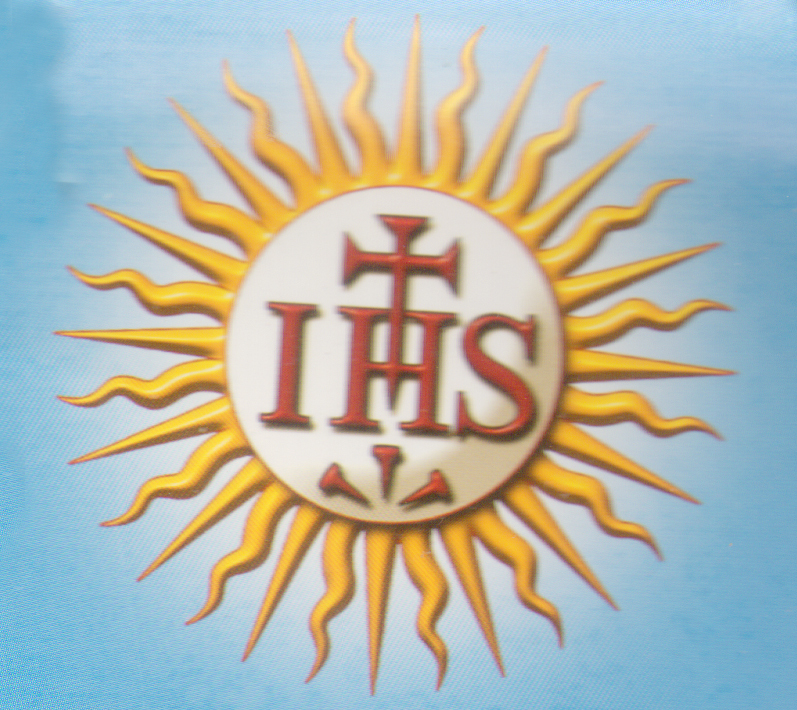 IHS, the initial letters of the Greek words, Jesu, Huios, Soter – Jesus, Son, and Redeemer is the motto of the Society of Jesus. The little flower shows our aim to illumine the world and society. "Spreading Light and Burning Bright"